The Gas Plumbers at Fresh Living Group are a specialist team of highly qualified licensed tradesmen with many years experience across a wide variety of gas plumbing applications including; gas appliance installation, new gas connections, installing internal and external gas outlets, isolating and repairing gas leaks, servicing gas fireplaces, installing / repairing gas hot water systems. Gas is one of the most energy efficient fuels that we use but like electricity it can be dangerous if in need of repair. The cost of having a qualified licensed gas plumber install, service or repair a gas appliance or outlet pales into insignificance compared to the cost of not doing the job properly and suffering the consequences. Should you ever smell gas inside your home or outside near a gas hot water system or gas bbq outlet call us immediately and we will advise you on what steps to take before dispatching one of our emergency gas plumbers to your location. In the event that we can’t take your call, ring 000. 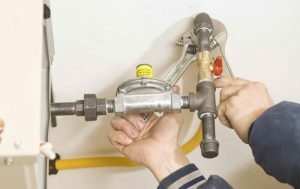 Call us on 1300 373 745 or click HERE to contact us online for all your gasfitting or gas plumbing requirements.